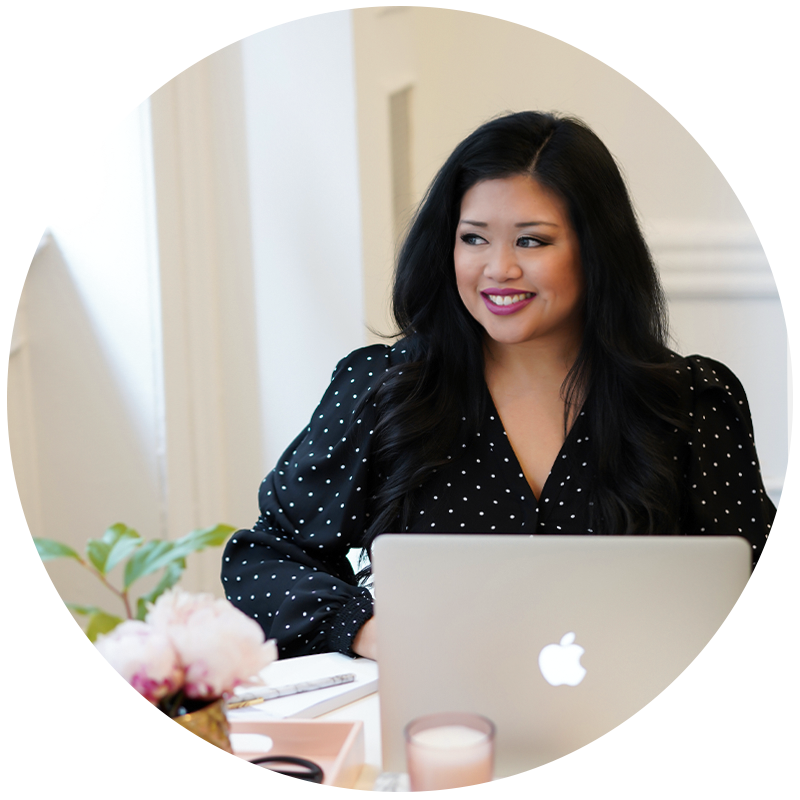 May was Styled Stock Society affiliate month which means over the course of the month we shared tips, strategies and resources with our affiliates to help boost their affiliate income. Each week we focused on a different aspect of affiliate marketing strategy to help our affiliates up-level their affiliate marketing strategy – whether they were new to affiliate marketing or had been at it for awhile! 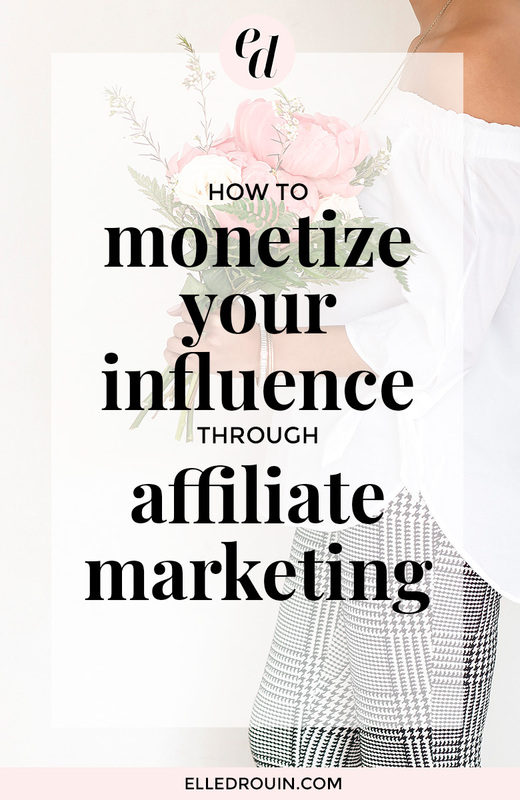 As I was creating the content for our affiliates I realized that it could benefit my blog readers as well so I've combined some of the tips I shared throughout the month into a massive blog post to share how you can monetize your influence through affiliate marketing! It really doesn't make sense to promote things to your audience that aren't relevant to them. It's confusing, it's not effective, and honestly it's just a waste of everyone's time. For example, people who are interested in joining the Styled Stock Society are most likely women with online businesses / blogs so it wouldn't make sense to promote the Styled Stock Society to women who have no interest in building a brand online. On the flip side, I get pitches for affiliate programs all the time for things I don't use (and have no interest in using) which is always confusing to me because whyyyy would I promote something I don't use?! If you have your own affiliate program, you're going to have higher conversions from affiliates who genuinely love using your products / service and want to share it with their audiences! There are a ton of different types of affiliate programs. Some pay you a percentage of sales. Some offer a flat rate. Some are pay per click (even if the click doesn't result in a sale). Some have recurring payments. Some offer credit instead of a payout. The point is – not all affiliate programs are alike, so you have to figure out what makes sense for you. For example, when I was first getting started with affiliate marketing, I used a pay-per-click affiliate program to monetize my blog and would earn cents any time people clicked on my affiliate links – this was DUMB because at the time I didn't have a huge audience – so the number of clicks on my links was nothing to get excited about… and definitely not “worth it” for me. On the flip side, I've also been a part of affiliate programs that paid 50% commissions based on sales (for products worth hundreds of $$$) which makes wayyyy more sense to me! PS – our Styled Stock Society affiliate commissions are 30% per referral which works out to anywhere from $20-$90 per sale! We think that's a pretty solid deal for our affiliates! If you're using your website / blog to promote your affiliate links, there are several ways you can optimize your website to increase your affiliate income. If your blog has a sidebar, this is an easy place to add promo images with affiliate links so that anyone who is reading your blog can easily see the tools you use and recommend. If you don't have a sidebar (or a blog), you can still add promo graphics to other parts of your website (resource pages / thank you pages / contact pages / linktr.ee / wherever it makes sense to promote your favorite resources to your audience). Speaking of resource pages, make sure to include your affiliate links on your resources page and if you don't already have one, now is the perfect time to add one to your website (here's an example of mine!) – a resource page is just a page on your website where you can share links to the tools + resources that you use for your business or blog. People are always curious what tools + resources other people use, so this is an easy way to have them all in one place (and share all the the awesome things that you are an affiliate for)! Update or insert affiliate links in existing content – if you've been blogging / vlogging / etc. for awhile, you might have created content that's relevant to the products / services that you are an affiliate for, so instead of creating totally new content, you can just update old posts with your affiliate links! I'd recommend starting with your most popular posts and seeing if they are relevant to any of the affiliate programs you are part of. For example, if you are a Styled Stock Society affiliate, your posts don't actually have to be about stock photos, but they should be relevant in some way – for example: if you have a blog post on creating social media graphics, you could insert a sentence about how using styled stock photos helps you do that… or if you have a blog post about productivity you could insert a sentence about how using resources like the Styled Stock Society save you time so you can focus on other things. The beauty of this is that since you're just updating posts, it won't take you a lot of time! When you're sharing the things you're an affiliate for with your audience, it's easy to add a sidebar graphic or link on a resource page but if you really want people to click on your affiliate links you need to give them a reason to TRUST you. Assuming you're promoting products / services that you actually use and recommend (which you should be!) – it shouldn't be too hard to think about why you think it's a good investment – how has it helped you? what has your experience been like using it? why is it better than other alternatives? a – Share a personal review – Rather than telling people to buy the thing you are an affiliate for, tell them why YOU invested in it! Writing a thorough review of a product / service can be extremely helpful for people who are considering making a purchase (especially when it comes to buying online). The more specific you can be with your personal experience, the better – for example, when it comes to buying clothing online, I always appreciate when people share their height / weight / body type (or even a photo!) when they review a product because that is more helpful than just saying “it fit perfectly!” – because something that fit perfectly on someone who is 5'10” is not going to fit my 5ft frame ? It can also be helpful to share specific results you've gotten from using a product / service so people can better understand how it can REALLY help them! For example, in this blog post I shared how using Bluchic's landing page templates helped me increase my revenue by $2,000/month on autopilot – I'm more than happy to recommend them because I've seen REAL results from using them! b – Compare popular options – “roundup” style posts (ex: 5 best spas in NYC! 8 irresistible taco recipes you must-try! 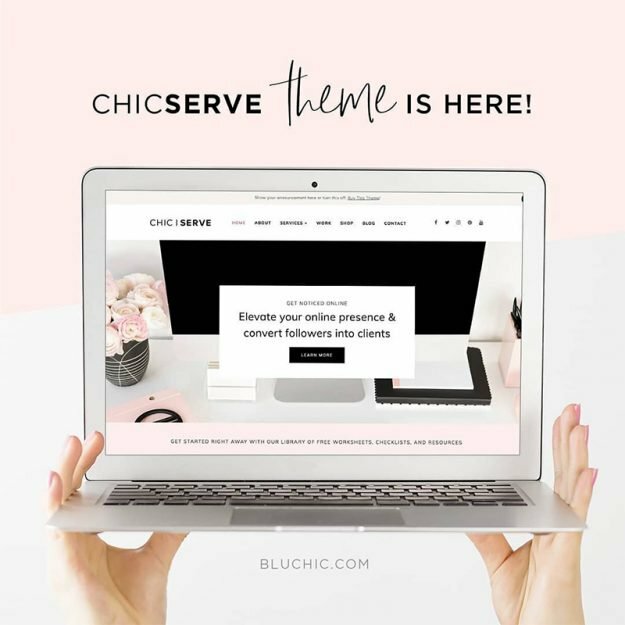 10 feminine WordPress themes for bloggers!) are popular for a reason. People like seeing a bunch of different options in one place. But you can take things a step further and really help them narrow down options by comparing a few popular products / services to help them make a decision. So instead of sharing 10 options, you would do a more detailed comparison of 2-3 options and share why you think they are best. I recommend writing a blog post because that way you can easily share your review (and re-share it over + over again). For example, I wrote this blog post comparing a few different social media schedulers and since this post gets regularly shared on Pinterest, I've earned enough affiliate income from it that I haven't had to pay for the scheduler I use since I wrote the review! c- Create a tutorial – Last but not least, another way to build trust with your audience through your content is by teaching them how to use something. So instead of just reviewing a product, you could show them exactly how you use it with screenshots or a video. Creating a tutorial not only builds trust with your audience but also establishes authority because you are demonstrating how to actually use something. This type of post is obviously geared more towards tools or products that you might be an affiliate for, and you might think that “how to use X” is easy / self-explanatory but I guarantee there are people in your audience who don't think it's easy! For example, when it comes to stock photos – I personally think it's easy to whip up social media graphics using stock photos and my brand templates but there are a ton of people who have no idea where to start when it comes to creating them! If you use stock photos for YOUR business, you could teach people how to create social media graphics / blog post graphics / etc. too! … How did you find the product / service? What first attracted you to the idea of it? … What are some things that you considered when investing in the product / service? Price / value? Ease of use? Style? … Why did you ultimately make the decision to buy the product / service? … What has your experience using the product / service been like? How has it helped you? How has it made your life easier / better? … Who would you recommend the product / service for? You can have really amazing blog posts or a website that's fully optimized for your affiliate links, but if no one ever sees them then it doesn't matter! Make sure you have a plan to get people to read the epic content that you're creating especially if you're using social media to drive blog post traffic – personally, I'm a big believer in scheduling at least some of your social media content and automating what you can to make things even easier. I shared more of my strategy in this blog post but in short, don't forget that if you just share something once on social media, the majority of your audience is NOT going to see it! That's why I love repurposing / recycling content (especially on social media). I have several blog posts and related graphics for tools and resources that I'm an affiliate for and I make sure that they are consistently being tweeted / pinned / shared to get more eyes on my content! If you want to share the Styled Stock Society love on social media, we even provide promo graphics and sample captions on our affiliate dashboard to make sharing easy! This next tip involves a little math, so bare with me if numbers aren't your fave thing…. Let's say you're a Styled Stock Society affiliate – standard commission rates are 30% of new memberships, which means you can earn $20.70 for referring a quarterly membership, $59.70 for referring an annual membership, and $89.70 for referring a lifetime membership. You could literally refer 1 new member and make $89.70 – that sounds like a pretty good deal, right? So if you want to give YOUR audience an extra incentive to click on YOUR affiliate, this tip is a simple one – add a bonus. Your audience is invested in YOU and there's a good chance they want something you offer. So why not create a win-win situation and offer one of your own products as a bonus for anyone who signs up using your affiliate link! For example, if you sell a digital download or template worth $25… you would offer it for free to anyone who joins the Styled Stock Society via your affiliate link (you can see your referral activity on your affiliate dashboard and/or can ask them to fwd a copy of their receipt to you for confirmation). Since you've already created your product, the “cost” of giving it away for free is minimal, and they get an added bonus while you make more affiliate income! I think adding a bonus offer makes the most sense when you have a digital product / program / course (something that you've already created) as opposed to offering a physical product or a service as a bonus (which requires more $ or more of your time). If you don't already offer a digital product, Sarah Morgan has a great list of 10 digital products you can make in just one weekend. If you've got the wheels turning and think that you have a bonus idea that makes sense to offer, don't forget to make sure your offer is aligned with the product / service that you're promoting. If you don't have a product / service that is relevant to the people who would be interested in the thing you are promoting than it doesn't make sense to offer something as a bonus. You also want to think about whether or not your bonus offer is “worth it” for both you and your audience. This is a bit subjective because it involves thinking about how much time / effort is required on your part as well as having a sense of what your audience thinks is valuable – but if your bonus offer is worth $5 that's not much of an incentive and if it's worth $500 then you're probably missing out on potential income because that's worth more than your potential commission! If you're just getting started with affiliate marketing, I would recommend taking note of all of the tools / products / services / resources you are already using, determining if your audience could also benefit from them, and then seeing if there are existing affiliate programs for them. And if you're a Styled Society member or you've purchased stock photos from our SHOP or you've used our free stock photos for your business or blog, don't forget you can join the Styled Stock Society affiliate program and earn 30% commission for any new members you refer! CLICK HERE TO JOIN and you'll get access to more of our affiliate resources to help you grow your income through affiliate marketing! Do you have any other affiliate marketing tips?! 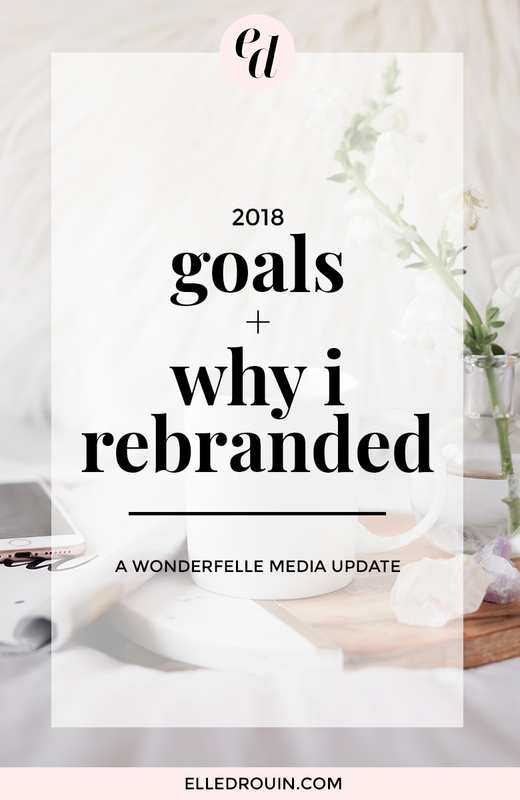 In case you didn't know, my name is Elle Drouin (you might know me as “Elle from wonderfelle”) and while I've owned this domain for years, I have sort of been “hiding” behind the wonderfelle brand. For 2018, my word is VISIBILITY. I feel like I've done a “good” job at growing my business, but honestly, most of my marketing has been pretty passive – I'm much more comfortable behind my computer screen or behind a camera, but I think that more personal connection, more active marketing, and more VISIBILITY overall can only lead to being able to help more people through my business (and also more revenue). Since this is my main website, I decided to rebrand to make it a better representation of well, me! Regardless of how my business shifts in the future, I think that this change makes the most sense for me moving forward. Whether I'm styling / photographing / consulting or doing something totally different down the line, my name isn't going to change! This will be my main website and where you can find more information about how we can work together. I'll continue to share business / marketing tips on my blog as well as more behind the scenes lessons from my own businesses. Any old links should be redirecting to the new site, but if you come across any links that aren't working, let us know and we'll make sure they are updated! You can get in touch with me directly via elle(at)elledrouin.com + follow along on Instagram, Pinterest, Twitter, and Facebook (note that my handles are all now @elledrouin instead of @wonderfelle)! The Styled Stock Society has become more of it's own sub-brand with a separate website and a (new!) separate Instagram where I'll be sharing more sneak peeks at Styled Stock Society collections as well as behind the scenes from our shoots. Next month we'll also be launching the Styled Stock Society blog where we'll be sharing branding and photography tips so stay tuned for that! For customer support or questions about the Styled Stock Society – please email support(at)styledstocksociety.com and a team member will be in touch. And last but not least, I have big plans for growing Mochi's brand in 2018 – if you're not already familiar, Mochi is my 3 year old maltipoo pup and she's kinda famous on Instagram. Next month we're working on rebranding HER website, launching the Mochi and the City guide to NYC, and our first physical products! If you're interested in collaborating with Mochi, feel free to reach out to us at mochiandthecity(at)gmail.com (if you think it's weird that she has her own email, you'd probably be surprised to know she also has her own phone too)! I have a mix of professional and personal goals because, to be honest, they are often intertwined for me! I've built my business intentionally to enjoy certain freedoms (like being able to work wherever/whenever), but that also means planning work around life and vice versa (like planning trips around brand collaborations). These are a few of my “bigger” goals for the year that will guide what I focus on and how I manage my time, but I tend to break things down quarter by quarter to actually get things done! 1) As a mentioned before, my word of the year is visibility – so to quantify the ways in which I aim to be more visible, my visibility goals are 12 podcast interviews, 6 speaking engagements, and literally being visible (showing my face) on Instagram stories 100 times this year. Just typing that out makes me uncomfortable, but I'm pretty sure pushing myself out of my comfort zone is a good thing! 2) I have an income goal in mind, but rather than sharing that, I think it's more important to focus on the things that I'm doing to actually achieve that goal. One of the things that has had the biggest impact on growing my income is growing my email list, so my goal for 2018 is 40,000 email subscribers. I still have some planning to do in terms of mapping out where all these new subscribers are coming from, but I am confident that if I put in the effort, this is a reasonable goal for the year! 3) This year I also want to commit to only working 3 weeks per month. Last fall I started working fewer days and intentionally taking a week or so “off” to travel each month, and I've really loved having that time away from work. For me, this makes more sense than taking Fridays off or taking a longer vacation a few times a year, but I am not always great about “not working” while I'm traveling, so I do want to make sure that I'm scheduling in non-working days too. I find that when I have some time for myself, I'm more inspired and more motivated on the days that I do work, so I guess focusing more on self-care is tied into this goal as well! 4) On a related note, this year I want to take at least 8 trips + 4 staycations. I'm not differentiating between work / personal trips because they are usually a mix of both, but I really want to take advantage of having the flexibility to work from wherever as well as do more travel partnerships with Mochi. 5) Last but not least, I ‘d want to a collaborate with other businesses at least once a quarter. When I say collaborate, I'm thinking larger scale collaborations like custom Styled Stock Society collections or joint venture partnerships that are more than just doing a webinar or an Instagram story takeover. I actually just added this to my list of goals so I have no specific ideas in mind yet – so if you're reading this and want to collab, get in touch! I'd love to hear your goals for the year as well – let me know in the comments!